First it was Shakespeare. Ibsen and Chekhov followed after. Even Miller has been reinvented. 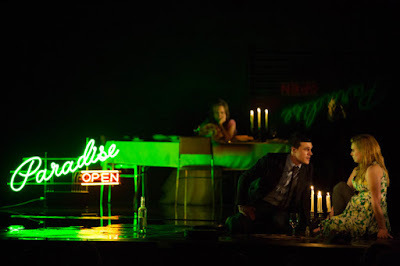 Now's the time for Tennessee Williams to be redefined on stage. In the latest revival of The Glass Menagerie, the memory play finds itself in modern times. Purists, stay far away. Helmed by Sam Gold, this reinvention brings some incredible new insights into the text, yet also veers, at times, unrecognizably too far. The Glass Menagerie is regarded highly as one of the greatest American plays. And it is. It’s a family drama told through the perspective of Tom Wingfield. It should be remembered that The Glass Menagerie is in fact a memory play. And a memory play can be interpreted as one sees fit. There is wiggle room. But how much until it's no longer the same play? The production has a modern perspective with a nearly blank stage, featuring a basic folding table, chairs, and prop shelf curated by scenic designer Andrew Lieberman. To walk into a Broadway house and encounter this minimal set, it’s jarring. There’s nothing lavish about it. You wonder why not stage this production in a more intimate theater. But with nearly nothing, it allows Williams’ text to take center stage. You hear the words in a new way. And at times, Gold blatantly defies the text. From Amanda yelling at Laura to sit on a non-existent couch in a different room to her distinctly stating it’s time for the lace tablecloth when it’s anything but. Gold interprets the text in a manner that may be confusing, but he goes all-in with it. There are some haphazard inconsistencies when it came to staging and defining the rules of his world. It may have taken some time to get into this version of the play, but when it's stripped down to candlelight and Williams' exquisite text, The Glass Menagerie was at its best. Jim and Laura's scene was extraordinary. But it lived in another world from the rest of the play. It’s so stripped down that when something fantastical is introduced, like the waterworks creating the misty rain of the St. Louis night, it causes confusion. Lighting designer Adam Silverman shined brightest with the usage of the neon sign. In a production of bold moves, the insanely slow fade down of the house lights needed to be deliberate. Times when the house was fully out felt arbitrary. If this is a memory play designed by Tom, shouldn’t he be the one manipulating the world? Wojciech Dziedzic’s costume design was comfy modern, but Dziedzic’s moment of courage was the loud pink dress Amanda puts on. It was a statement piece to say the least. It caused a laugh from the crowd, but was that truly the intent? This production was essentially a showcase for Sally Field as Amanda Wingfield. And boy does she know how to work her magic. Despite the flaws of the production, Field gave a dynamic performance. With this casting, Gold highlighted the ladies of the play to create a true examination of the relationship between Amanda and Laura. Rather than living a life vicariously through her daughter, this Amanda was a biting, bitter woman jaded by living a life of care for her handicapped daughter. It was a lens that was beautifully unique. And it’s a shame that the production got the best of it. As Jim, Finn Wittrock is a captivating charmer. He has a genuine goodness that makes his rejection of Laura even more heart shattering. Madison Ferris as Laura held her own amongst her starry scene partners, though with the lack of stage business, Ferris got stuck when forced out of the main part of the scene. Joe Mantello as Tom was subtle, and shockingly faded into the back. With the focus mostly on Amanda and Laura, Tom’s outburst didn’t land as it should. The Glass Menagerie is a play that has been done to death, and yet there will always be something to explore. Sam Gold’s rendition is so stripped down, that if it’s not to your taste, the lack of intermission can make this play hard to sit through. Gold made a noble risk that unfortunately didn’t pay off this time.